Miss A is continuing to learn to use toddler forks and spoons and loves practicing. She also loves Italian inspired dishes and eating dinner with us. That means J and I are regularly trying to come up with dinner recipes that work for all three of us. We had success once with this pork dish (probably because it contained A’s beloved apples), but not with much else since. 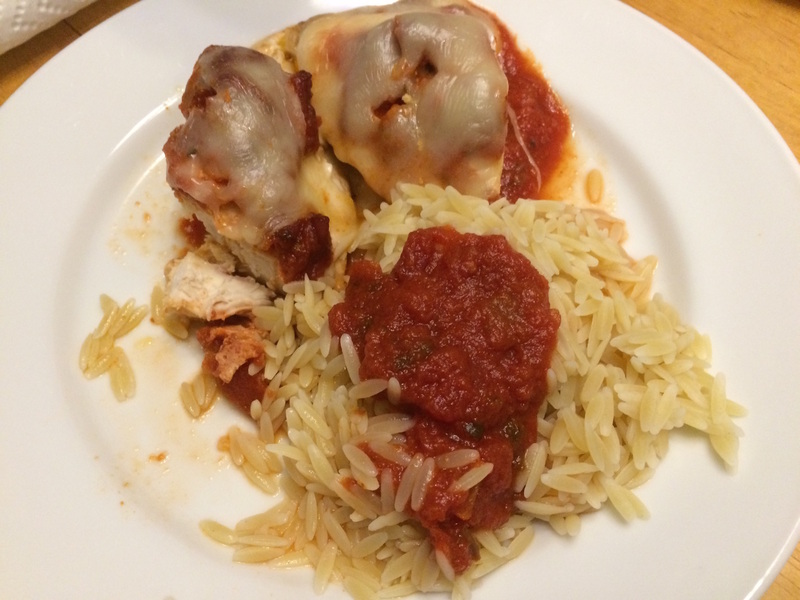 On a whim, I whipped together this baked chicken and orzo dish. She couldn’t get enough and kept asking for more! Yes, yes you can bake from frozen! I was thrilled to discover this after reading the back of the bag of frozen chicken. First, preheat the over to 350 degrees. Then put the olive oil in the bottom of the pan. We've used everything from a pie plate to a baking dish. What you use doesn't matter as much as making sure the bottom is mostly coated in olive oil. Put the chicken breasts on top of the oil and add pasta sauce. Bake for at least 45 to 50 minutes. Check for done-ness by cutting the largest chicken breast to see if it is still pink. If it is, put it back in the over for 10-15 minute minutes and check again. Since we baked from frozen, it usually takes about an hour of total baking. Because the chicken is topped with sauce and resting on olive oil, we haven't had any issues with drying it out even the one time I accidentally cooked it for almost an hour and a half. When there's about 15 minutes left in baking, cook the orzo per the package directions. We also like sauce, so we heat up about a cup and a half of the remaining pasta sauce in a sauce pot on the stovetop. When the chicken is cooked through, remove from oven and place mozzarella slices on top. It should melt. Serve over top the orzo and sauce with your favorite vegetable. Miss A is partial to peas. Truthfully, it’s a bit bland for our palates, but a little salt and pepper after go a long way. As A gets better at chewing and using utensils, we will season and then brown the chicken before baking. This dish is super easy and very simple to get going before we pick Miss A up in the evening from school.